A 63-year-old man with a history of non-obstructive coronary artery disease, heart failure with preserved ejection fraction (HFpEF), morbid obesity, stroke, neuropathy, hypertension, chronic obstructive pulmonary disease, gastroesophageal reflux, and hyperlipidemia presents with acute sharp stabbing left-sided chest pain. He had a previous episode of sharp left-sided chest pain while driving 1 month prior, which was short lived and associated with shortness of breath. The electrocardiogram (ECG; Figure 1) shown is his presenting rhythm. The patient's ECG (Figure 1) demonstrates which of the following? A. Typical atrioventricular nodal reentrant tachycardia (AVNRT). C. Typical atrial flutter with 2:1 AV conduction. D. Idiopathic fascicular left ventricular tachycardia. The correct answer is: A. Typical atrioventricular nodal reentrant tachycardia (AVNRT). The ECG shows a narrow QRS tachycardia with heart rate at 151 beat per minute (bpm), normal axis, and a QRS duration of 102 milliseconds. There is a discrete P wave at the terminal end of the QRS complex resulting in a pseudo-R' in lead V1, indicated by a "blue arrow" in Figure 2. A pseudo-S wave in the inferior leads marked by the "red arrow." These represent retrograde P waves, and are not seen in the baseline ECG when sinus rhythm was present (Figure 3). The R-P interval is very short at 60 milliseconds (one and a half small box), which indicates parallel and simultaneous activation of atrium and ventricle via the fast pathway. The P-R interval is very long due to conduction over the slow pathway. 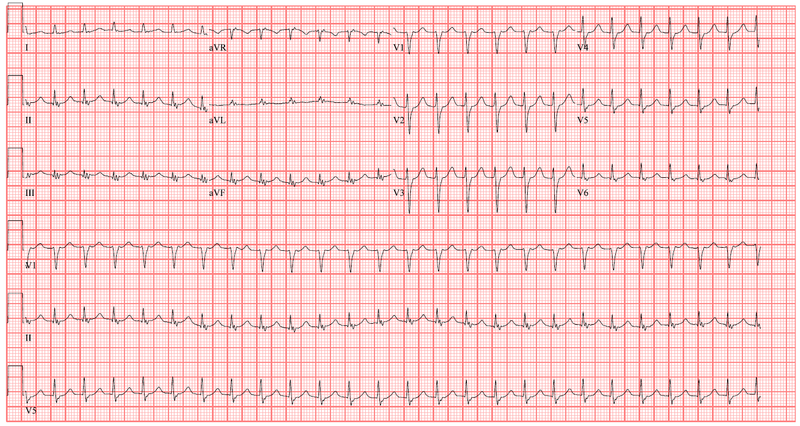 This is very specific and diagnostic for slow-fast (typical) atrioventricular nodal reentrant tachycardia (AVNRT). Figure 4 shows a ladder diagram of typical AVNRT. The first two beats are examples of sinus rhythm with conduction over the fast pathway (red arrow). The third beat indicates a premature atrial contraction (PAC) arriving during the refractory period of the fast pathway. The conduction proceeds down the slow pathway (light blue arrow). When the signal reaches the AV junction, the fast pathway is no longer refractory, and conducts the signal retrograde (red arrow) to the atria. This impulse arrives at the slow pathway and conducts antegrade, perpetuating the arrhythmia. There is simultaneous activation of the ventricle and atria. Typical atrial flutter with 2:1 AV conduction should always be considered in the differential diagnosis of supraventricular tachycardia with a heart rate in the 150 bpm, but there are no flutter waves seen. Sinus tachycardia is commonly seen in the heart failure patient, especially during acute decompensation. There are no sinus P wave seen. Ventricular tachycardia is unlikely, since the QRS duration is typically wider than 140 milliseconds. However, idiopathic fascicular left ventricular tachycardia [ILVT] originates from the ventricular septum resulting in a narrow QRS ventricular tachycardia [120-140 ms]. It also has pathognomonic ECG criteria including right bundle branch block (RBBB) morphology and left axis. ILVT is a reentrant tachycardia, and posterior fascicular VT is the most common form of ILVT. It is characterized by slow antegrade conduction traveling from the base to the apical third of the septum. Then fast retrograde conduction occurs over the posterior fascicle. ILVT is commonly mistaken for supraventricular tachycardia with aberrancy. Pieper SJ, Stanton MS. Narrow QRS Complex Tachycardias. Mayo Clinic Proceedings 1995;70:371-5. Zipes DP, Foster PR, Troup PJ, et al. Atrial induction of ventricular tachycardia: reentry versus triggered automaticity. Am J Cardiol 1979;44:1–8. Please share your thoughts on this Patient Case Quiz in the comments section below. Please note: You may identify yourself via the "Guest" fields, but there is no additional need to login to ACC.org in order to comment. Improve your ECG interpretation skills with ECG Drill & Practice!